"Will have a significant and negative impact"
The Newspaper Publishers Association has hit out at the BBC Trust for allowing the BBC to bring out mobile apps. 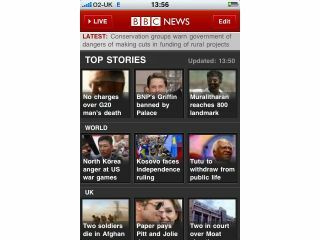 The BBC Trust decided against a 'public value test' before allowing the BBC to begin the process of bringing out apps, and starting with the already popular BBC News app for iPhone. However, the Newspaper Publishers Association [NPA] expressed its 'disappointment' in the decision, with director David Newell expressing his belief that it will have a 'significant and negative market impact'. "It is disappointing that the BBC Trust has decided to push this through quickly and avoid conducting a formal PVT, despite the BBC's previously stated aims that 'where actual or potential market impact outweighs public value', the BBC should leave space clear for others' and that 'it must listen to legitimate concerns from commercial media players more carefully than it has in the past'," said Newell. "The launch of BBC mobile apps represents a significant change to the BBC Online service, and we believe it will have a significant and negative market impact upon the viability of the business models of commercial news organisations in the app market," he added. The BBC has always had to tread carefully in relation to other publishers – with the sheer size and reputation of the broadcaster, and its unique funding through a licence fee, meaning that it can quickly become a 500-pound gorilla in new areas. But, the public tends to side with BBC in these matters, so despite their reservations, it seems unlikely the argument from the NPA will conjure much sympathy.